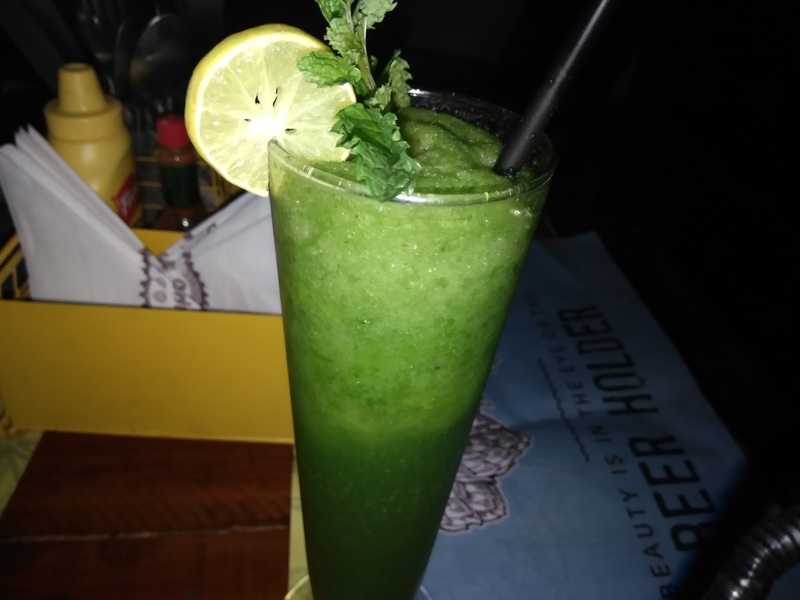 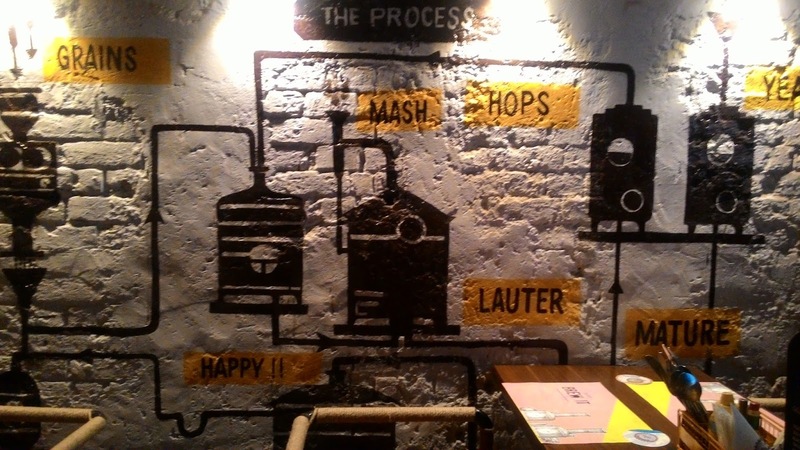 Ministry Of Beer is the newest entrant on the food scene in Connaught Place. 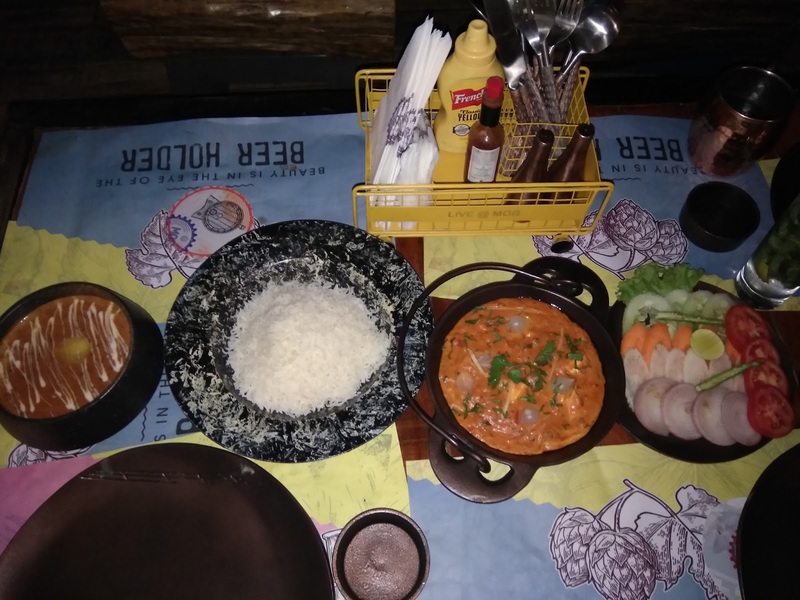 Having heard a lot about the outlet, a few days after its launch, I decided to pay these folks a visit to reckon what all the buzz was about. 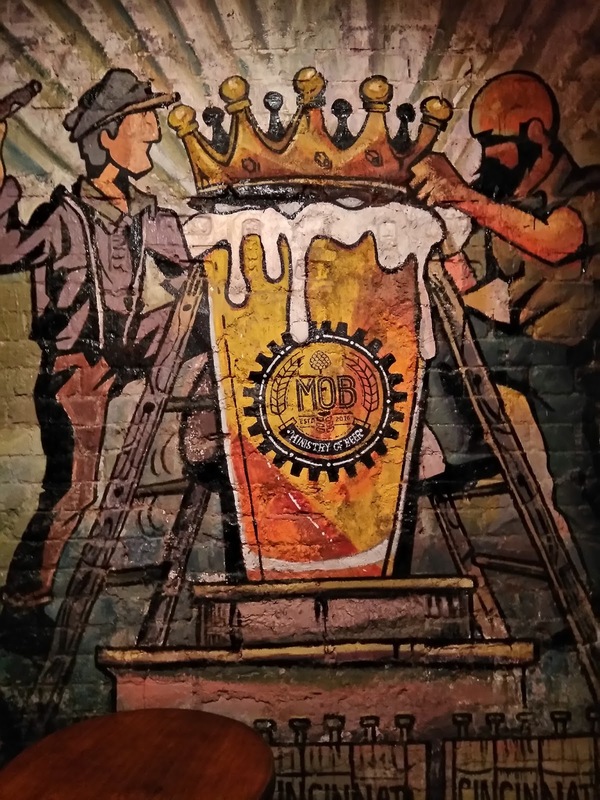 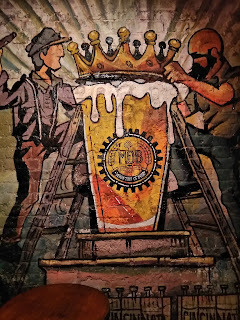 MOB Brewpub is located in M Block, Outer Circle, and is in the same line of outlets as 38 Barracks and House of Commons. 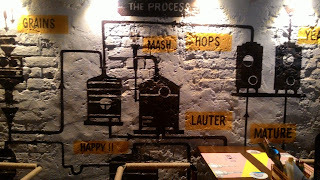 The outlet has been divided into three sections from within, with their brewery on the ground floor and a small seating area on the first floor in the first section, from where patrons enter. 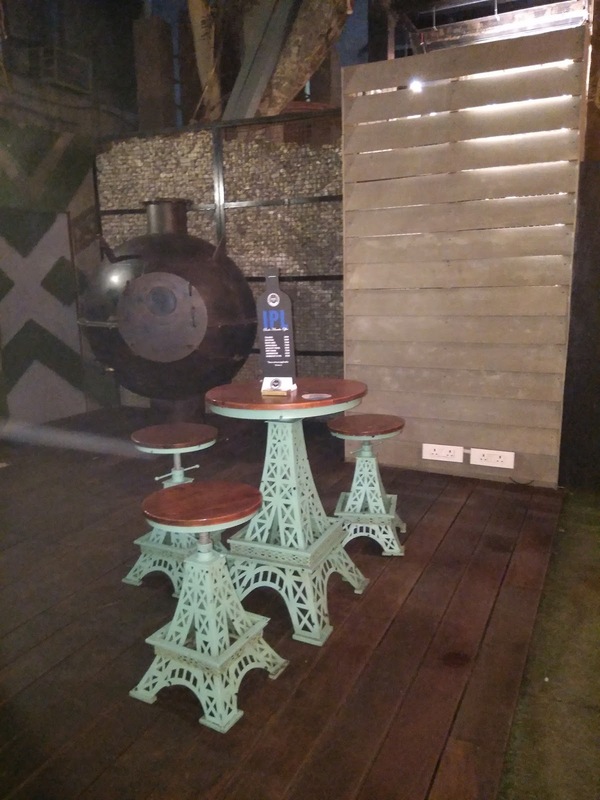 An exit from the first section leads to the second - an open air seating space which is essentially a smoking zone of sorts. 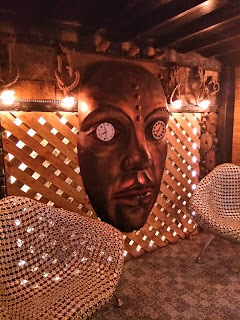 A staircase from this open area leads to the third - a three-floor seating space wherein the first floor houses their kitchen (that has a host of welding helmets all over its wall, to hint at Work in Progress) and boasts of two private dining areas. 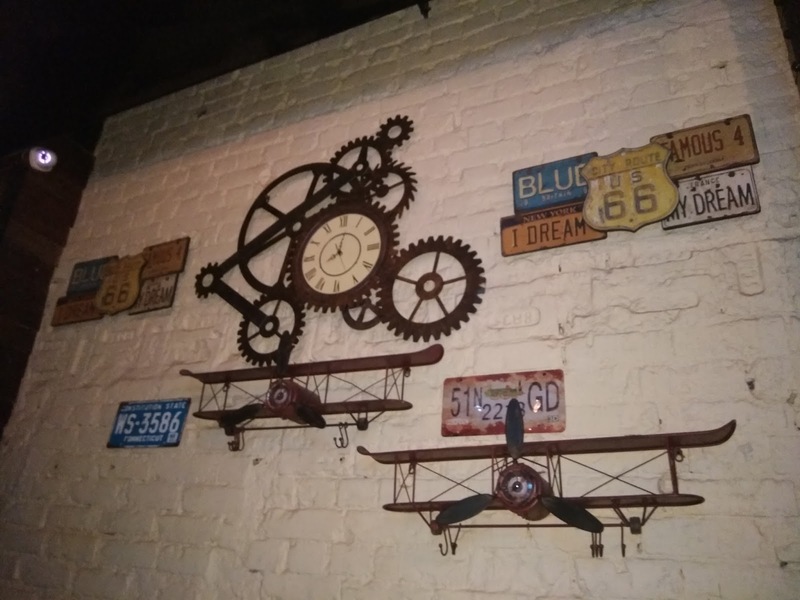 Much thought has been put into the design and decor of the space by Sandeep to reflect chic elements that burst with the quirky resemblance to artistic perspective. 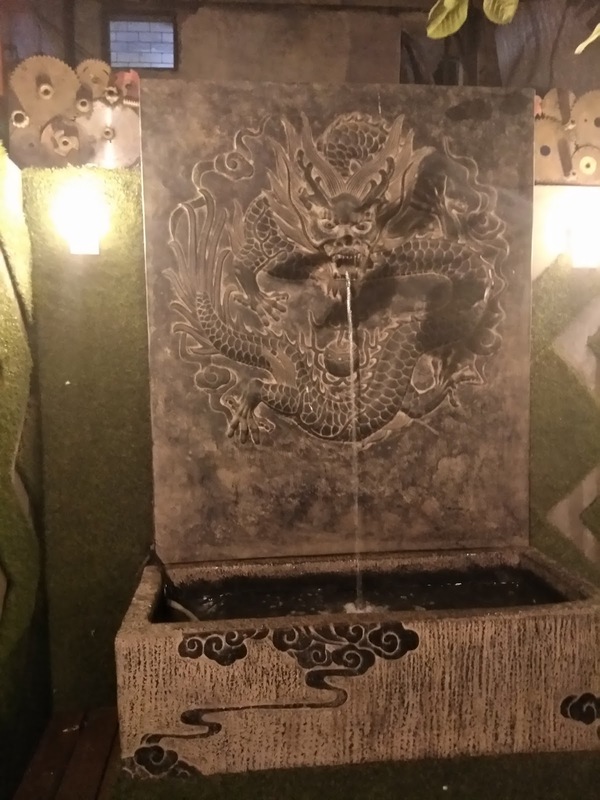 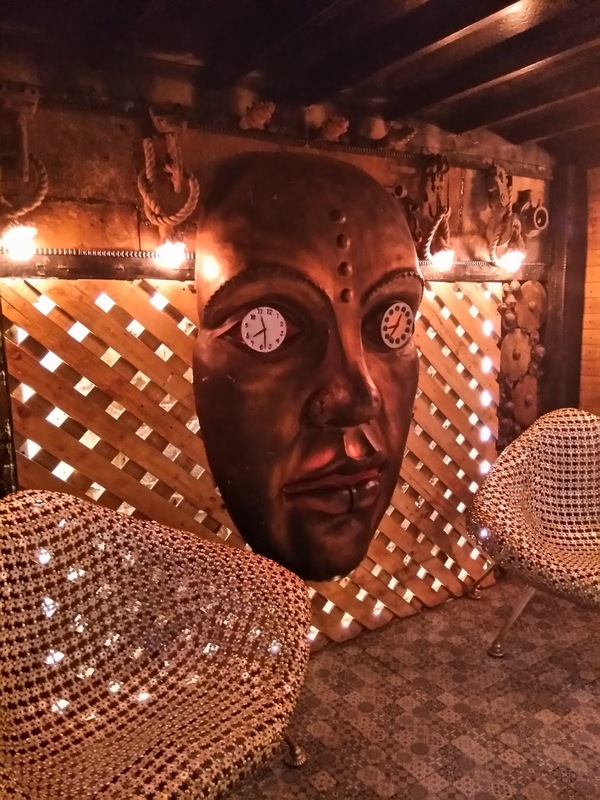 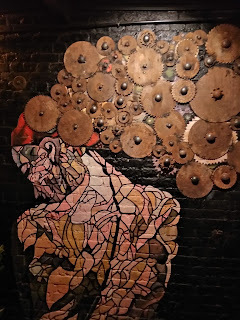 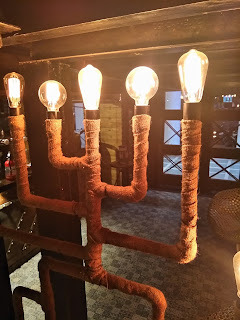 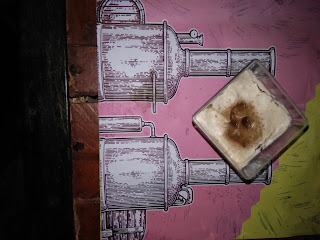 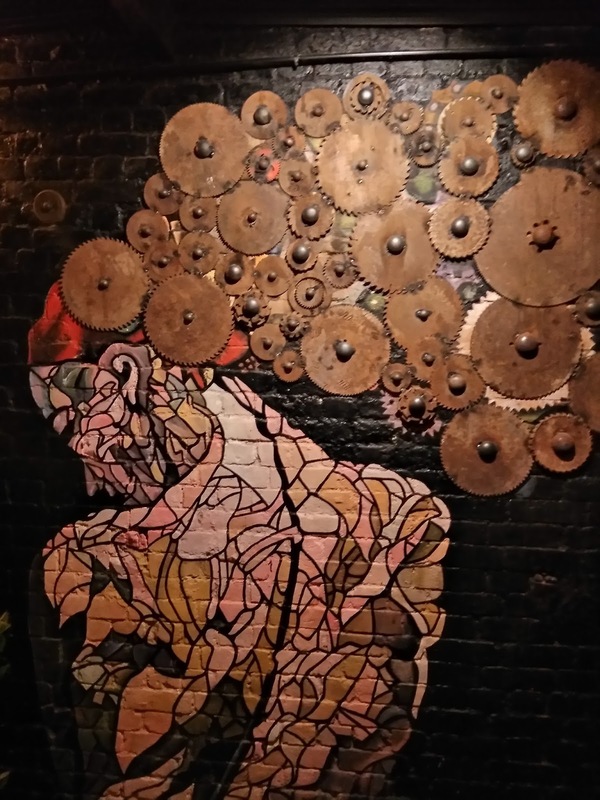 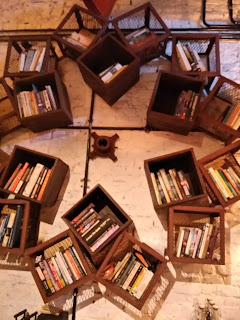 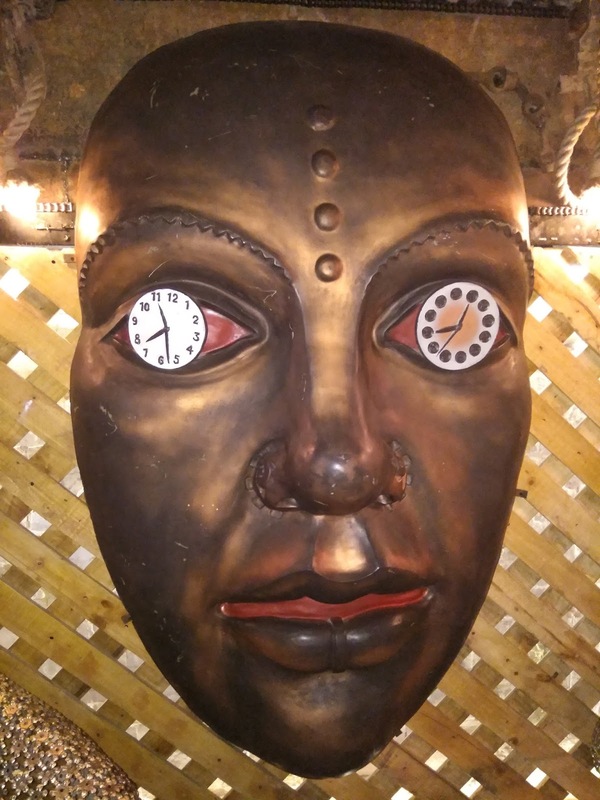 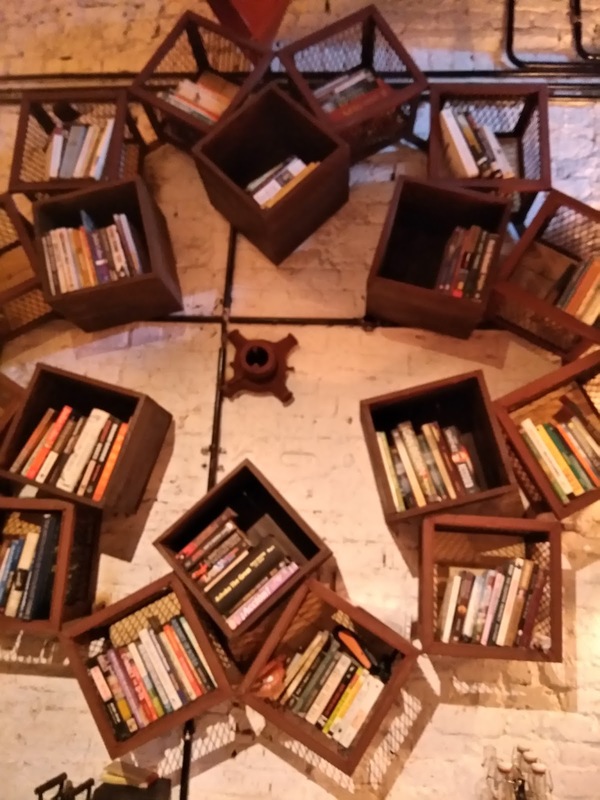 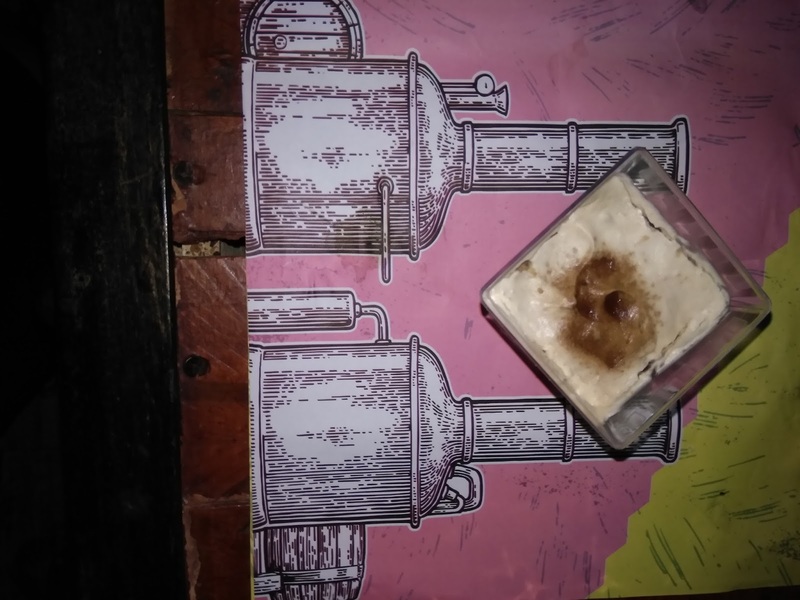 Take for instance the chairs made of cog wheels on either side of a mask that has clocks for its eyes, or the process of fermentation being depicted in front of the bar on the ground floor, or the metal anthuriums on the wall in the first section. The seating inspired by Eiffel Tower, or a full blown dragon spring in the open area, or the lady with cogs for its hair painted at the staircase, or the cogs, wheels, number plates and a wall model of the Wright Brothers' airplane in the private dining area. All such interior designing innovation resonates with the fact that MOB is a youth oriented hospitality destination. 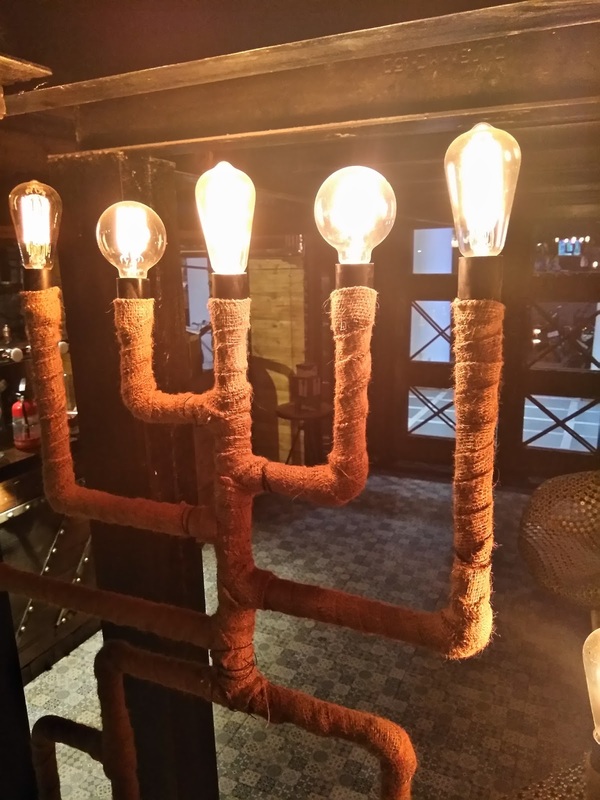 Needless to say, the aesthetic value impresses. 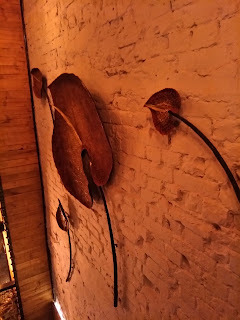 The style reflects not just in the interiors but also the food. 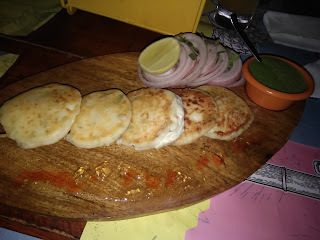 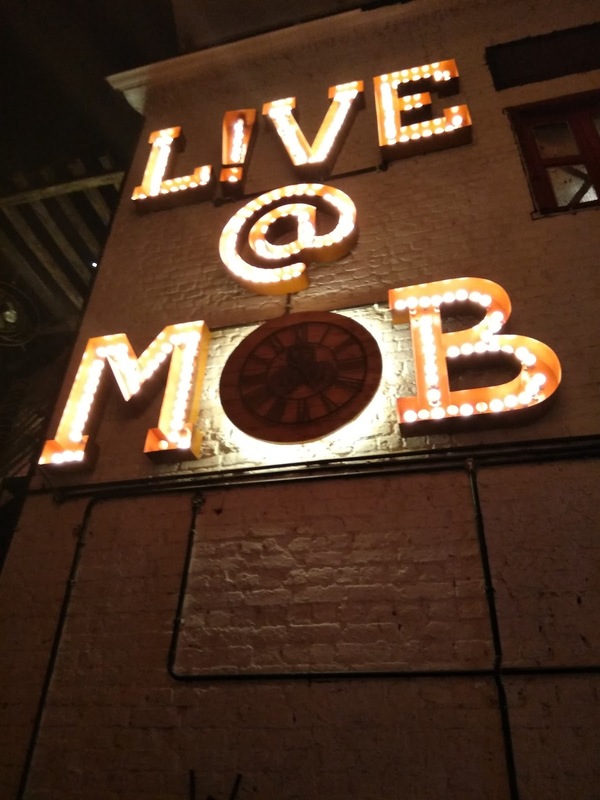 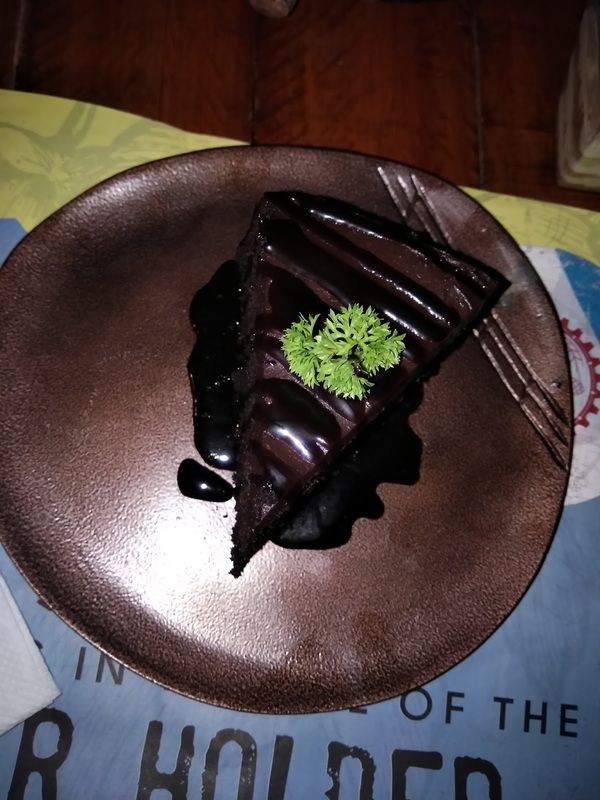 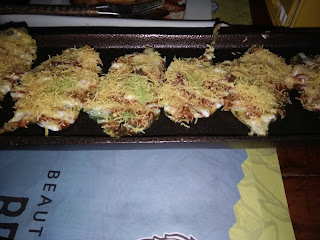 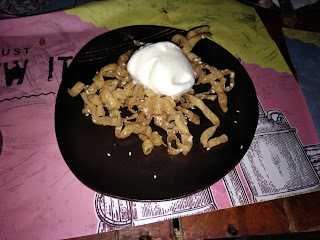 With a host of cuisines being served at MOB, there's a lot of variety to be chosen from and as always, I took the easy way out by means of a menu curated by the Chef at MOB. Hot Basil Sole Fish was crisp on the outside and soft on the inside. 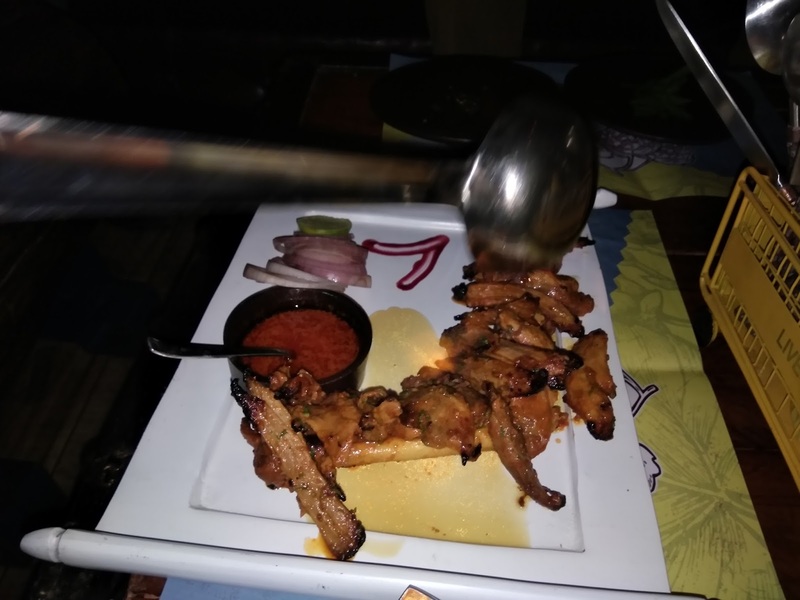 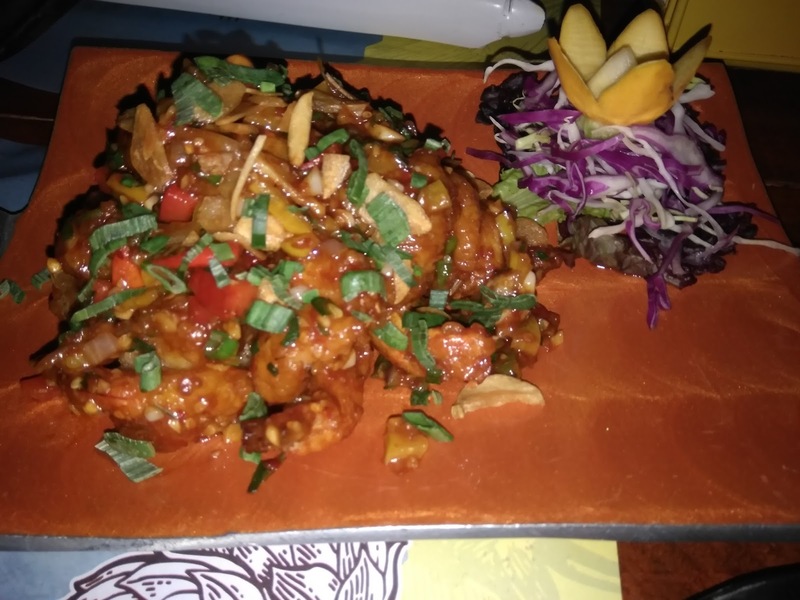 Old Monk Tandoori Raan is the signature dish being served at MOB. Chili Prawn had the right amount of spice in them. 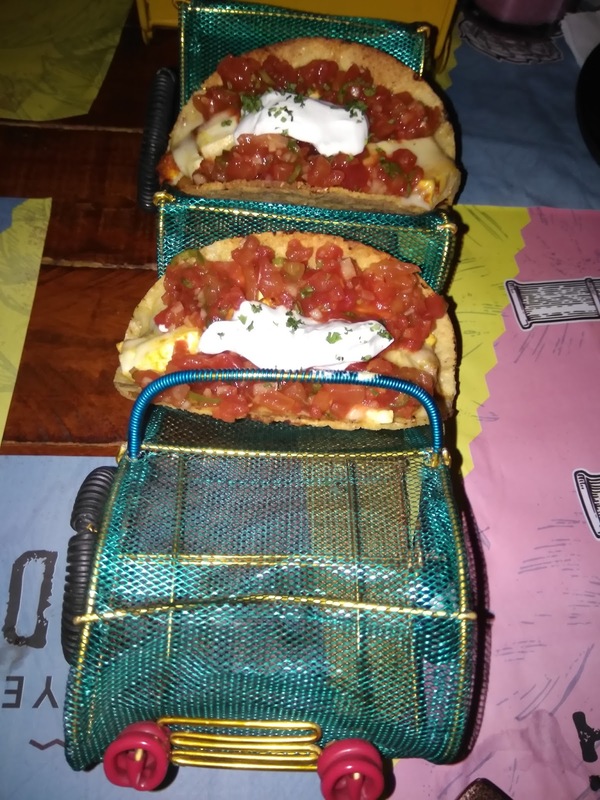 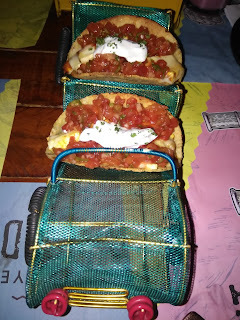 Paneer Tacos were served in an aesthetic manner atop an automobile of sorts. 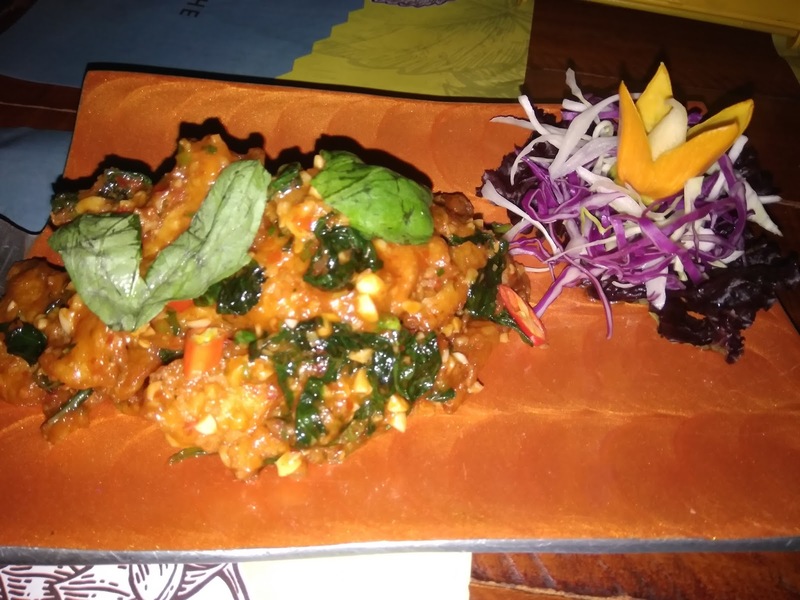 Palak Patta Kalamata Olive Chaat was the quintessential crispy spinach leaves topped with a host of dips and Sev. 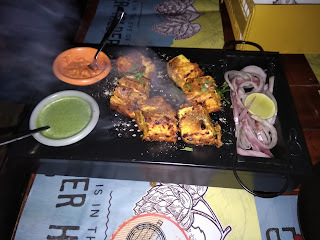 Achari Paneer Tikka was a delight from the Tandoor, chargrilled in a fine manner. 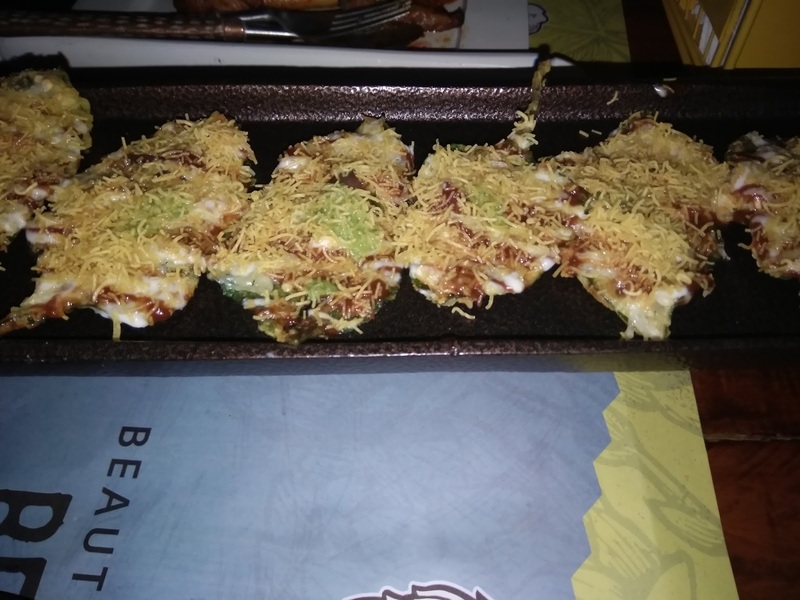 EBI Tempura Maki was essentially Sushi and I found this one to be in close contention with the one served at The Bento Box. 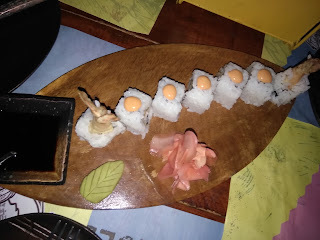 In a similar manner, it was presented with wasabi and ginger. Mascarpone Dahi Kebab was served with a glaze of orange dip along with mint chutney. 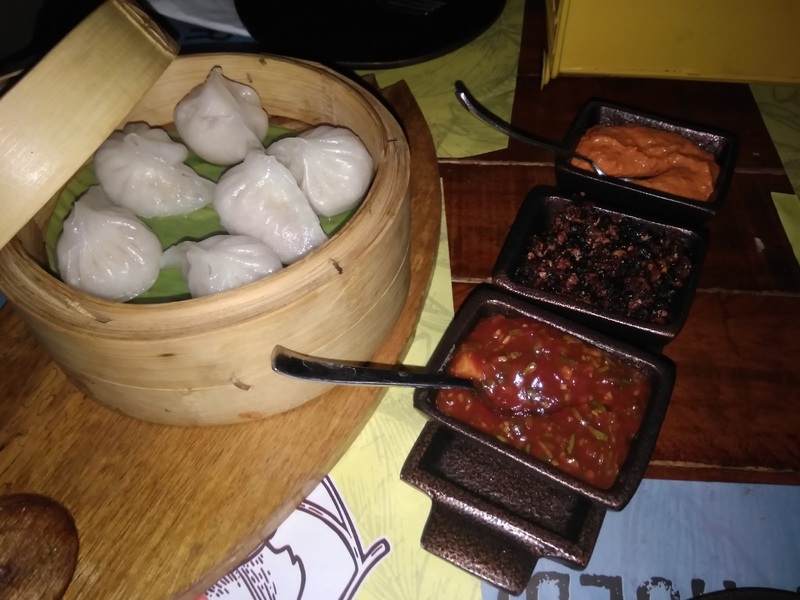 Chicken Hargaw was essentially Dimsums that came in a steam basket accompanied by complementing dips. 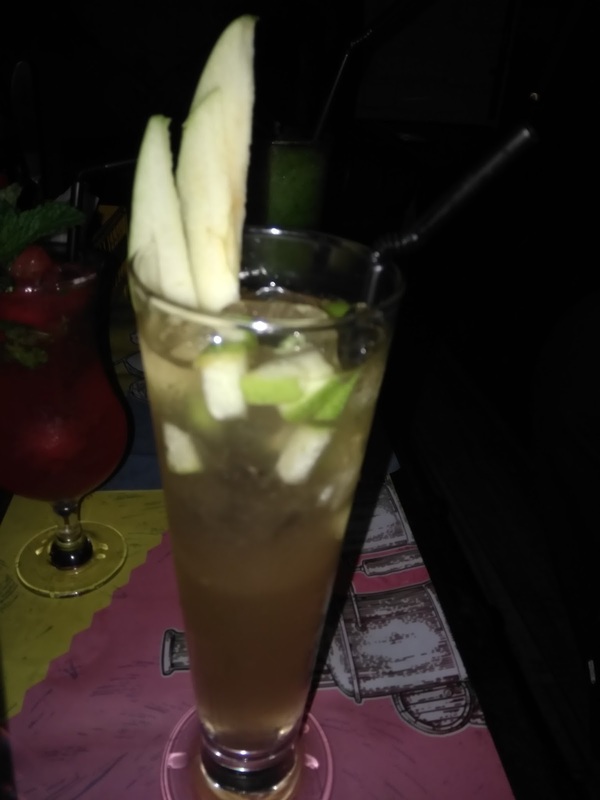 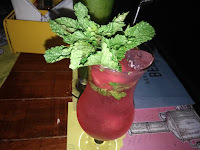 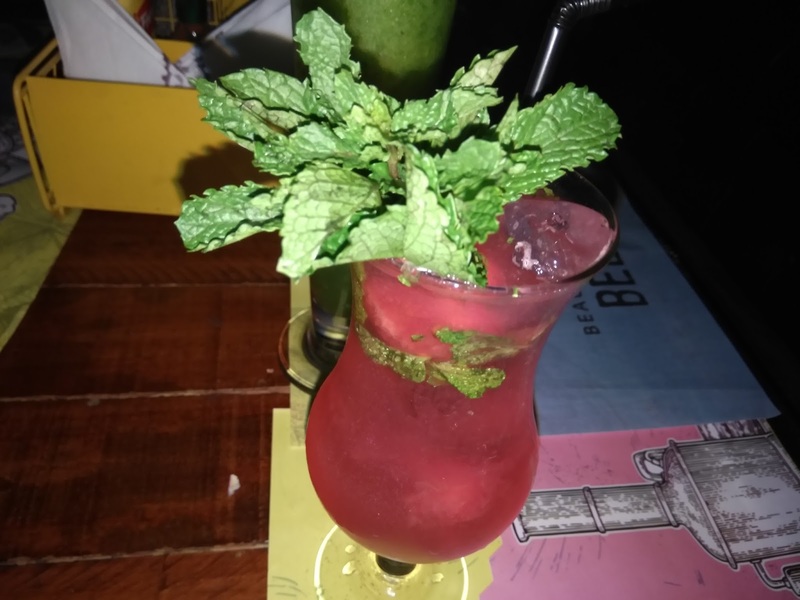 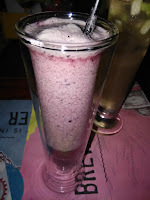 A range of the best-selling mocktails was presented for tasting. Darsan was the classic honey dipped flat noodles topped with sesame seeds and served with a scoop of vanilla ice-cream. 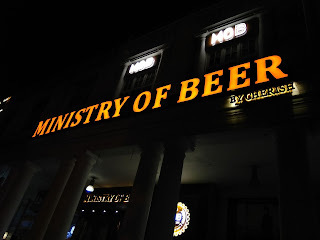 All in all, I feel that the buzz around Ministry of Beer is justified as these folks are acing it with their ambiance, food, and service.